All ready for a fantasy catwalk show? Publisher's blurb: "So much more than just another stylish garment! "Why stick to the same old cloaks and capes of yesterday, when you can pick up the latest in adventuring fashion? 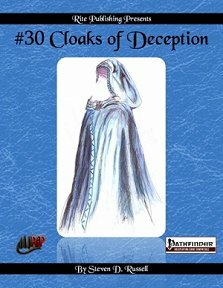 #30 Cloaks of Deception provides a wide array of options, from the awe inspiring cloak of authority to the mysterious cloak of dusk and dust to the fearsome cloak of the beast. These cloaks permit characters to fake their death, like the cloak of false ending, or turn light into darkness, like the cloak of the void. Special rules showcase the Legacy cloak, Trickery's Cowl, which allows characters to perform rituals revealing new powers and aspects over time. And each cloak offers a lesser, greater, or superior version while allowing for Resistance benefits, enabling Cloaks of Deception to be improved and augmented, keeping them a part of every hero's panoply - from the lowly novice just striking out into the world to the seasoned veteran who travels the distant planes before lunch. "So why stick with that plain old cloak your characters have been wearing for the last ten years when you can get something more? Get #30 Cloaks of Deception!"